Drs. 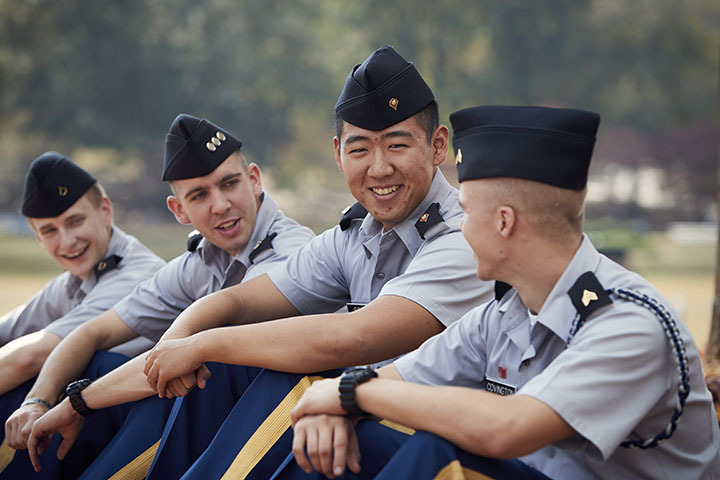 Wen-Jang Chu, far left, and Rong-Hua Ma speak in Chinese with cadets during a recent visit to the University of North Georgia. Two administrators from the Republic of China Military Academy recently visited the University of North Georgia (UNG) to develop a proposed exchange between the two schools that could begin in 2014. About 10 cadets from the academy, located in Kaohsiung, Taiwan, also visited the university. 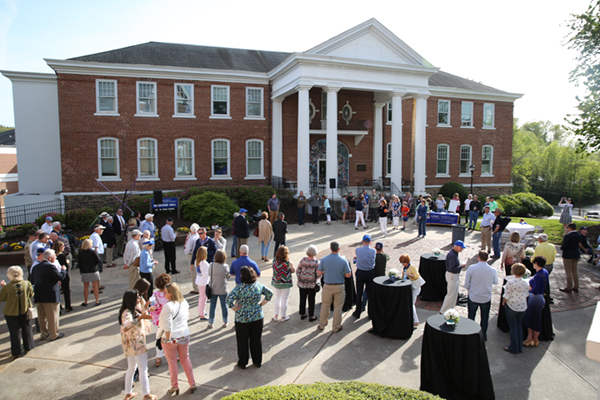 The proposed exchange is one of many partnerships either being created or already established between UNG and schools across the world, fulfilling UNG's strategic vision to help students become globally competent citizens. The university is working on new partnerships with schools in Germany, Italy, Latvia, and Oman, according to John Wilson, acting director of UNG's Center for Global Engagement. "The Republic of China Military Academy offers UNG a great opportunity to partner with a premier Taiwanese military institution," Wilson said. 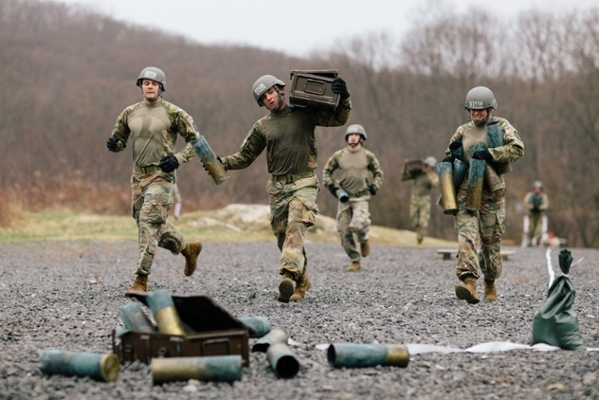 "As one of only six senior military colleges in the United States, UNG stands to benefit from this association through both student and faculty exchanges." UNG President Bonita Jacobs, Provost Patricia Donat and Professor of Military Science Col. Todd Wilson previously visited the Taiwanese academy, which has some 1,200 cadets. On Aug. 19, the first day of fall classes at UNG, Dr. Rung-Hua Ma, the academy's dean of academic affairs and Dr. Wen Jang Chu, director of international programs, spent a whirlwind day visiting with a number of administrators and faculty members, including Jacobs, Donat and Wilson. The two Taiwanese administrators also spent a few minutes with UNG cadets taking a Chinese class. Chu, who also is an assistant professor of political science at the academy, said he looks forward to the opportunities the UNG will create. "The University of North Georgia is a great university and much larger than our academy. Dr. Ma and I are very impressed by all the people we've met today, from President Jacobs to those we met during lunch," Chu said. "We will work together to develop the kind of exchange programs to send the cadets of both schools to each other so they can increase their international exposure and strengthen relations." Ma, a professor of mechanical engineering at the academy, said he was pleased by the welcoming attitude displayed by UNG faculty, staff and administration. "It is my pleasure and honor to visit your university. I feel your sincerity toward us and our cadets," Ma said. 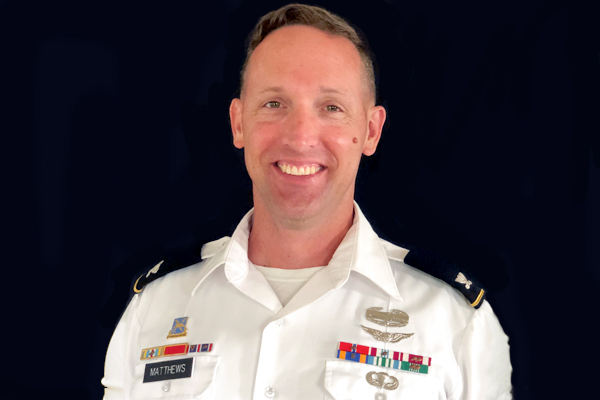 "Our purpose here is to further finalize the details of the agreements, including whether the cadets will spend a short amount of time or a longer time in the exchange. I hope out cadets can come here to polish their English and increase their international experience and I look forward to seeing their accomplishments." During the UNG visit, a draft exchange agreement was concluded with plans to begin student exchanges in 2014. Wilson said the two Taiwanese administrators were pleased after their visit. "They were impressed by the UNG campus and level of interest and support by the Corps of Cadets. They spoke favorably about the organization and high quality instruction at UNG. Most notably, they commented on the Chinese language capabilities of UNG cadets," he said. Chu said the academy also has invited Jacobs to attend the school's 90th anniversary celebration next year to help the school celebrate the milestone.